Friday March 14th 1884 I was at home all day sewing and made May a calico dress and finished up the other one. Mother went to town in the afternoon. The Doctor was over to see Rob again today. Saturday March 15th 1884 I was at home at work all day, swept the house nearly all over, washed and ironed some besides doing other work. Jim Stevens and Ellen with Hattie were here awhile early in the afternoon. I went to bed early. 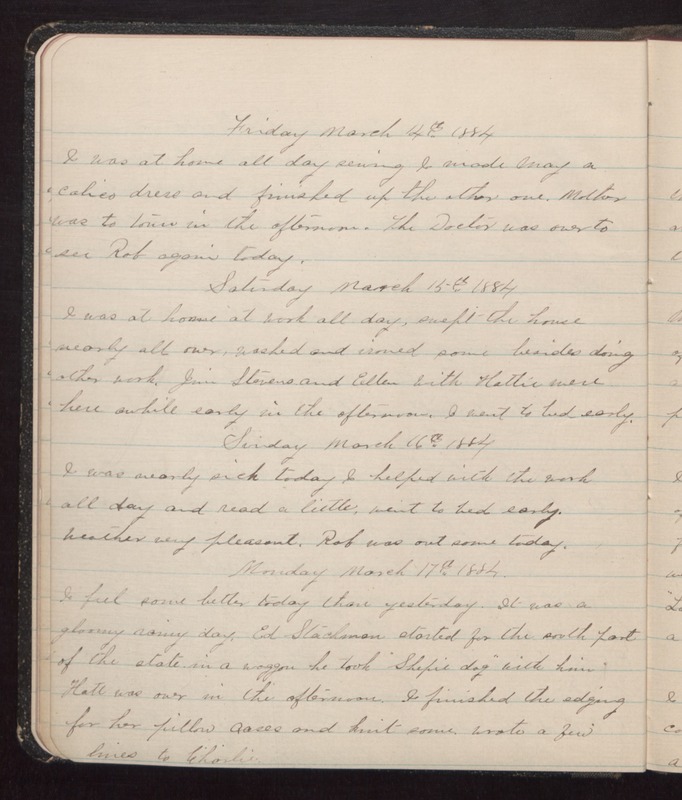 Sunday March 16th 1884 I was nearly sick today and helped with the work all day and read a little, went to bed early. Weather very pleasant. Rob was out some today. Monday March 17th 1884 I feel some better today than yesterday. It was a gloomy rainy day. Ed Stackman started for the south part of the estate in a waggon he took "Shepie dog" with him. Hatt was over in the afternoon. I finished the edging for her pillow cases and knit some wrote a few lines to Charlie.